While diversity of local care and support is the positive result of a health and care system that is responsive to the diversity of the community it serves, unwarranted variation in quality, access and outcome is not acceptable. Local government is committed to addressing this and is best equipped to lead improvement. The first publication in the LGA’s recent think piece series on the future of adult social care and support posed the question: why does social care matter? A clear picture emerged from across our expert contributors that the core value of social care lies in supporting people of all ages, with a range of mental and physical health conditions and needs, to live with maximum opportunity, independence, connection to others and control. This is the core value of adult social care and support: it helps people to live the lives they want to lead, building on their own aspirations. One in five people have some contact with the social care and support system. That might be as part of its workforce, as a user of services, or as one of the millions of invaluable unpaid carers. Therefore, while you might not need care now or in the future, you are almost certainly going to be connected to it because of those around you. Social care is also a vital piece of the puzzle that is needed to hold our communities together, making connections to other council services and those provided by local partners. This can help create a network of local support that enables people to be themselves and to fully participate in and contribute to their communities. In the process, this makes those communities more resilient and sustainable; more human. The Review pointed to two key system shifts. First, towards greater personalised care and the building of wellbeing and resilience through co-designing health and care systems with citizens and communities. And second, a bigger and more strategically resourced role for VCSE organisations “which thinks and acts whole-person, whole-family and whole-community”. Social care is also central to the fortunes of our NHS and managing pressures on our hospitals in particular. Care and support, and its links with primary care and public and community health, helps keep numbers at the front door of hospitals down. For those who require time in hospital, that same support in the community helps keep the back door open so people can return home in a safe and timely fashion. Latest statistics for May 2018 show that delays leaving hospital due to social care are down by 39 per cent since July 2017. To put that into perspective, delays due to the NHS are down 13 per cent over the same period. Finally, the scale of social care is huge. It comprises more than 20,000 organisations and a workforce of more than 1.5 million. Skills for Care estimates that the sector contributes £46 billion annually to the UK economy (£38.5 billion to the English economy) and independent care providers are an integral part of many local economies and a driver of employment and local economic growth. Carers UK estimate that the economic value of the contribution made by unpaid family carers in the United Kingdom is a staggering £132 billion a year, more than annual spending by the NHS. Supporting people’s wellbeing has wider benefits for our economy. As the Government’s Industrial Strategy notes, “Innovation in age-related products and services can make a significant difference to UK productivity and individuals’ wellbeing”. The Strategy’s ambition to create “an economy that works for everyone, regardless of age” must recognise the link between good health and greater economic participation – both as workers and consumers. The percentage of people aged 65+ who work has risen to 10.4 per cent from 6.6 per cent since 1992 and people aged 65+ contributed or spent £37 billion to the UK hospitality sector in 2015 (27 per cent more than people aged 35-54). If everyone worked for a year longer, GDP would rise by 1 per cent. More broadly, it is estimated that grandparents now provide up to 40 per cent of childcare, enabling their children to pursue their careers without restriction from prohibitive childcare costs. The focus must not be confined to older people. Demographic trends do not just forecast a growing elderly population but a growing number of working age adults with learning disabilities, mental health problems or long-term conditions who will need adult social care and support for them to lead independent productive and fulfilling lives. Putting the right support in place to help tackle the disability employment gap – the difference between employment rates of disabled (49 per cent) and non-disabled people (80 per cent) – would support working age disabled people into meaningful employment and contribute to local economies. Just as important is supporting people with a mental health condition to remain in, and thrive at, work. The 2016 Stevenson and Farmer review noted that, “300,000 people with a long-term mental health problem lose their jobs each year”. The review found that, “The cost of poor mental to government is between £24 billion and £27 billion” (costs associated with providing benefits, loss of tax revenue and costs to the NHS) and that, “the cost of poor mental health to the economy as whole is…between £74 billion and £99 billion a year”. Neither should we just consider the national picture. Locally, and particularly in areas with lower employment rates and lower economic output, the care sector is a major and vital employer of local people who, in turn, support the local economy. When it comes to the importance of social care being a local service, expert contributors to our think piece series were equally clear that ‘local’ matters. At the heart of this principle lies the greatest strength of local government: its democratic accountability to the people it serves. As all communities are different and require a unique arrangement of services, the importance of local accountability cannot be overstated. Recent LGA polling on resident satisfaction shows that councils are the most trusted form of government to make local decisions about services in a local area, selected by 72 per cent of respondents. Just 17 per cent of respondents selected national government. Similarly, local councillors were selected by 68 per cent of respondents as the individuals most trusted to make decisions about local services. By comparison, 13 per cent of respondents selected MPs and just 7 per cent selected government ministers. Despite a challenging financial environment, adult social care and linked services have worked hard to continue to deliver, improving people’s lives in a number of ways. Prioritising care and support: Between 2010 and 2017, adult social care has had to make savings and reductions worth £6 billion as part of wider council efforts to balance the books. But the service continues to be protected relative to other services. The latest ADASS budget survey shows that adult social care accounts for a growing total of councils’ overall budgets, up from 36.9 per cent in 2017/18 to 37.8 per cent in 2018/19. As a result, by 2019/20, 38p of every £1 of council tax will go towards funding adult social care. Innovating: Councils are committed to innovation to help reduce costs while maintaining or improving services to the public. This has included changing the way that demand is managed, more effectively using the capacity in communities to help find new care solutions, and working more closely with partners in the NHS to reduce pressures in the care and health system. Innovative approaches can be found in all parts of the country. Intervening early and preventing needs: Investing in prevention has clear benefits for people and reduces costs to the wider care and health system. There is a great deal of work across the country to help people avoid unnecessary hospital admission and support to increase people’s independence. Performing: Even in the deeply challenging financial environment in which the wider social care sector has operated over the last few years, there are many instances of performance having been maintained or improved. This includes performance on satisfaction levels, adults with a learning disability living in their own home or with family and the proportion of people using services who say they feel safe and secure. A range of case studies demonstrating the work of councils and their partners on the above areas can be found at Annex A. These illustrate the significant improvements and innovations which the social care sector has delivered, despite the most challenging circumstances. It is a sector worth investing in. We increasingly live in a connected and digital society. Of course, digital and care-related technology is not on its own the solution to addressing our adult social care or public health related challenges and it is not a replacement for person-centred care and support. However, better use of data in adult social care offers the potential for more preventative and personalised approaches to care to be established, and emerging technologies offer the potential for new business models to flourish amongst providers of care whether they be large or micro care providers. Councils have an important role to play in shaping their care market and areas such as Liverpool and Luton are collaborating with care providers to support innovation. Digital approaches are enabling valuable time of our workforce to be freed up, allowing them to spend more time with those they are supporting whilst at the same time improving the quality of care. It has the potential not only to enable staff to more effectively communicate with one another (helping to address the quarter of care providers who say the quality of information they receive on discharge is not sufficient) but also reduce the chances that people have to tell their story multiple times by joining up information from organisations. Progress has been made but still only three in 10 councils say that they have the information they need from health partners. Technology has the potential to help people live more independently for longer, supporting the focus on prevention. Many of us are increasingly adopting smart technologies around the home and increasingly homes are being designed in a way that can both meet but also adapt to our everyday needs. Understandably, people’s expectations are increasing. People want to be able to make quicker and more informed decisions about their care choices which means providing the right information at the time they need it. At the same time people want to be more in control. This might include giving people more opportunities to easily request the support they need and manage their personal budgets (such as in Harrow) or allow some of the worry to be taken out of caring by giving much more useful and timely information to those in a caring role. Of course, digital is not right in every situation and where it is introduced it needs to remain person-focused, building trust with individuals. This means starting by understanding the aspirations and needs of individuals and co-designing approaches with them. Councils such as Salford are working with local organisations to support the city’s most vulnerable. The 2016 LGA publication ‘Transforming social care through the use of information and technology’ provides evidence from across the country of how both social care and public health are designing approaches that incorporate aspects of digital and data – not only saving money but importantly delivering better outcomes for individuals, carers and the workforce. But as our green paper demonstrates there is still a significant way to go and only with much needed sustainable investment alongside local leadership can existing good practice be extended. Our LGA innovation programme in social care, funded by NHS Digital demonstrates examples of where councils are co-designing approaches that use digital and data. However, these small-scale funding initiatives whilst helpful are not sufficient. The national priority being given to data and technology needs to be re-balanced and show a greater commitment to support local but scalable innovation in adult social care helping to address the systemic challenges that the sector is currently experiencing. Whilst there is a huge amount of impressive work going on across the country, there is much more we can do to improve, even within existing funding arrangements. Polling suggests that the public remain concerned about achieving a consistent standard of care both in social care and the NHS, and preventing a ‘postcode lottery’. Variation in itself is not a bad thing; diversity of care and support is needed to address the diversity of different communities, and it would be wholly wrong to suggest that every area should have exactly the same set of priorities or range of services for their local population. But nobody wants to see radically different experiences of, or access to, services based solely on where you live rather than on what you need and want. This is one of the reasons that the Care Act introduced a national eligibility framework, to ensure that people across the country are entitled to care on broadly consistent criteria. There is little evidence that running services nationally makes them more uniform than services planned and delivered locally. The idea that more national systems and approaches would necessarily help eradicate unwanted local variation is flawed: it could exacerbate inequalities which only a highly localised response can address. As is any notion that local government is more variable than other public services. Within the NHS for instance, there is still very significant variation in access, quality and outcomes, including delayed transfers of care attributable to the NHS, Continuing Healthcare eligibility, the rate of patient safety incidents and the availability of IVF treatments. The chart in the Annex B shows that social care performance is no more variable than NHS performance overall. More broadly, variability is not unique to the public sector and is instead an inevitable feature of life. The accessibility and availability of banks, shops, transport connections and restaurants is part and parcel of what makes every area different. We need a system in which variation reflects positive choices in local areas to reflect local needs and wishes, and to build communities that are inclusive, cohesive and promote the life chances of everyone within them. Councils’ bespoke solutions to local challenges also allow greater space for innovation and improvement to flourish, which is harder to achieve with national-level services. Local investment decisions help change the way things are done on the ground, creating services and partnerships – particularly with the voluntary sector – that benefit our communities. It is no coincidence that many national programmes start from best practice from within local government. The Prime Minister rightly wants best practice to be shared. And councils are keen to embrace learning through sector-led improvement, and have welcomed the findings of the CQC reviews of health and care systems. However it would be wrong to presume that a mandatory national inspection programme of council commissioning would necessarily improve matters. Local government has worked with government to develop its own sector-led improvement approach and it has been shown to be more cost effective than national inspection. The National Audit Office estimates that the cost of the previous top down inspection regime was in excess of £2 billion annually whilst the LGA receives just 1 per cent of that to facilitate its wider improvement support in councils. Large parts of the previous inspection regime were abolished by government in 2010 due to the expense. Sector-led support also delivers good results, with 95 per cent of chief executives and 96 per cent of leaders saying that it has had a positive impact on their authority. We recognise that the public expect, and have a right to, a consistent level of access, quality and effectiveness of care and support. Councils, working alongside national and local partners, are identifying where unacceptable variation exists and taking steps to tackle it. Local government is committed to working with national government to build on this work, and the sector-led improvement approach that underpins it, to ensure that any new funding for social care is used effectively. Examples of this work are set out below. Local government political and professional leadership increasingly recognises that significant improvements to people’s wellbeing cannot be made by just focusing on their part of the health and care system. The recent focus on delayed transfers of care (DTOC) attributable to adult social care is a case in point. Research undertaken for the LGA by Newton Europe into DTOCs attributable to social care in 17 health economies found that focusing on just one part of the system risks either ignoring underlying causes of the blockage or simply shifting pressure elsewhere. The work found that the best way to help patients through discharge is to ensure the focus on their longer term recovery. DTOC is a symptom of system malfunction, not of itself a root cause. Put the patient first and the rest will follow. The CQC local system reviews made a similar finding in relation to managing the flow of older people from community settings into hospital and back again. It found that the key driver to overcoming barriers to effective joined up working was local leaders sharing a clear vision to provide a shared purpose for people and organisations across the local health and social care system. Fragmented and separated systems for local government and social care get in the way of person-centred and place-based working. In particular, separate financial frameworks, performance management regimes, workforce planning and regulatory frameworks for the NHS and local government make it difficult to work together. We would welcome the continuation of these cross-sector reviews alongside a sector-led improvement approach to adult social care. Some health and wellbeing boards (HWBS) are the driving force for transforming care and support in local communities. They bring together political, health and community leaders to agree a vision and a shared approach to health and wellbeing which addresses the challenges facing their care and health systems. But others are not providing clear leadership and direction. We recognise that if they are to maintain their status as leaders of place, all health and wellbeing boards need to be effective. A key strand of our improvement work focuses on strengthening HWBs in this respect, equipping council leaders with the tools they need to work alongside clinical and counterparts. Councils recognise the importance of strong commissioning and are taking steps to ensure this drives improvement. Building on our framework for commissioning for better outcomes in social care, we are working with councils to focus on Integrated Commissioning for Better Outcomes. A future model of social care will need to continue to develop and strengthen integrated commissioning. Market Position Statements (MPS) are a requirement of the Care Act and encourage commissioners, people who use services, unpaid carers and providers to come together to consider what care and support services are needed in an area, why, and how they might be delivered. Councils recognise the value of MPSs and the need to ensure their robustness and quality. The LGA is working with councils and providers to develop the next generation of MPSs that focus much more on: the services needed in a local area; how they can support people to stay out of hospital and live independently at home; support to providers to recruit, retain and develop the care workforce. All of our work on systems has the primary objective of supporting councils to work with all relevant local partners to help keep people out of hospital and, if they do need inpatient care, return them to their communities and full independence as far as possible. An example is the Transforming Care Partnership, which helps ensure that more people with complex learning disabilities are moving from secure Assessment and Treatment Units to better placements in their own community near family and friends. Councils increasingly recognise the need for sound data sharing across health, social care and providers to deliver person-centred care and the role of technology to improve integration, efficiency and commissioning. Some areas face a particularly challenging financial environment and require expert support to steer their way through to steadier and more stable times. We have worked with 20 such areas to address real and present financial problems. This is our fastest growing area of support. Other areas need support to deliver efficiencies, particularly in learning disability and mental health services, and a range of work is being taken forward to help councils manage demand. As financial circumstances become ever strained, more areas are identifying the need to be better prepared on contingency planning in the event of large scale provider failure. Most councils are experiencing contract hand backs, but the risk of large scale failure is increasing as evidenced by the changing numbers in CQC’s market oversight regime. More generally, councils recognise the need to be smarter and more nimble at managing risk. All councils have used our risk tool in some form to aid their understanding of risk in key areas including leadership and governance, performance, quality, resources, workforce and delivering national priorities. The full potential of local government’s contribution to wellbeing is struggling to be realised following years of austerity. Councils are not unique in having had to respond to the impact of austerity and, like many organisations, have met the challenge head on. But the scale of the challenge they have faced, and the savings and efficiencies they have made, is significant and cannot be overplayed. Since 2010, successive governments have cut 60p out of every £1 of national funding for local council services, saving nearly £16 billion a year by 2020. 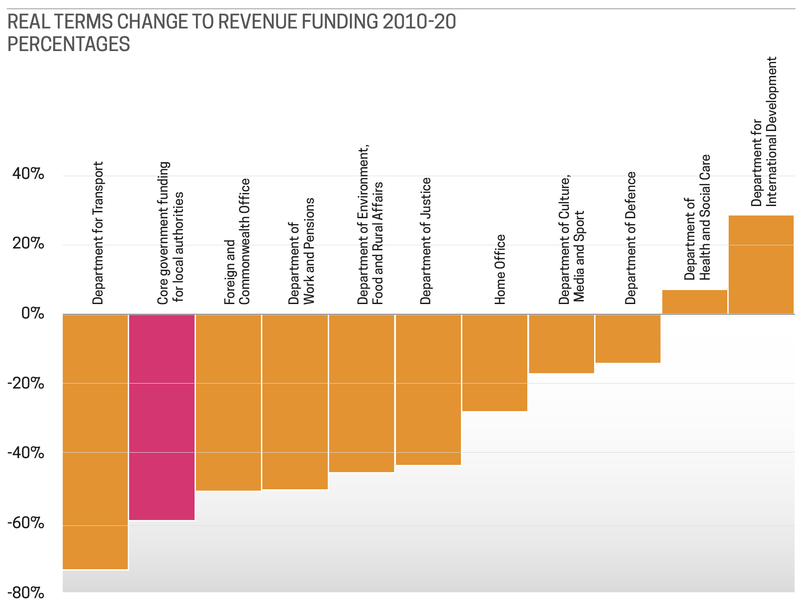 Local government has been cut considerably deeper than many other areas of the public sector and others have seen increases in their budgets, as the following chart shows. Councils have responded on multiple fronts. They have pursued an efficiency agenda rigorously. They are sharing staff, buildings and delivering services together. Some have merged, some have had to use money that was set aside for major investments to support day-to-day services. Wherever they can, councils have looked at different ways of delivering services and support to citizens, or taken action to reduce demand rather than making cuts. But against the scale of the reduction outlined, these efforts can only go so far. As the Public Accounts Committee has noted, “The harsh reality is that more and more local authorities are now showing signs of financial stress”. Today, more councils are struggling to balance their books and some are considering whether they have the funding to even deliver their statutory requirements. Put simply, councils no longer have the resources to support people in their communities. The local government funding position has serious consequences for wellbeing. It constrains adult social care which, in turn, constrains the voluntary sector and care providers. This is happening now and impacting on people’s quality of life today. The response has been to protect social care relative to other council services. But those other services are crucial to support people’s wellbeing, such as bus services, libraries and road maintenance. In this way, sorting out the long-term funding of adult social care therefore goes hand-in-hand with helping to sort out the long-term funding of local government. And that can only help improve people’s wellbeing. As social, community health and primary care face growing pressure, wellbeing deteriorates. As a result, people increasingly seek to have their needs met by turning to the part of our public sector which has arguably been protected from the full force of austerity: hospitals. But targeting investment primarily at the acute sector represents poor investment of public money. And more importantly, it is a poor outcome for most people needing care and support. The argument is bigger than simply saying we spend too much on hospitals. It is about arguing for investment for prevention across the wider system – social care, public health, the third sector and parts of the NHS – as part of a truly system-wide approach to embedding prevention and early intervention within our communities and in everything we do. Good investment and good outcomes for people requires a focus on these communities, ensuring people have the care and support (in the broadest sense) they need to live a good life – to be well, independent, living at home for as long as possible and contributing to family and community life. As with local government overall, adult social care funding is at its absolute limit, threatening the great progress that has been made in challenging circumstances. Innovation, prevention and performance may be some of the hallmarks of the last few years as social care has sought to insulate itself from the full impact of austerity. But looking ahead, the scope to continue in this way is greatly reduced. New research by the LGA shows that local government overall faces a funding gap of £7.8 billion by 2025, just to sustain current – and much reduced – levels of service. This includes, within adult social care, an immediate and annually recurring market provider gap of £1.44 billion; the difference between the estimated costs of delivering care and what councils pay. As demography, inflation and National Living Wage pressures build in subsequent years, the adult social care gap rises to £3.56 billion by 2025. And again, this is purely to stand still. To put this in perspective, this is more than five times the amount spent annually on councils’ park services, and close to the total cost of councils’ waste management for a year (£3.6 billion). The short-term funding gap must be closed as an urgent priority and as an initial step in securing the sustainability of care and support. Governments’ response to the challenge of adult social care funding in recent years has been short-term and incremental in nature. One off grants, the council tax precept for social care and increases in improved Better Care Fund funding have been helpful. But each mechanism has its limitations and they have not been sufficient to deal with all short-term pressures, let alone address the issue of longer-term sustainability. They also cease in 2019/20 with no clarity from 2020 onwards, which makes even short- and medium-term planning extremely difficult. Furthermore, the major Government narrative and focus of attention has been on services to support older people, largely overlooking the fact that much of the growth in cost pressures comes from the increasing needs of working age adults. As the Adass budget survey shows, services for working age adults now account for 58 per cent of the demographic pressure on social care budgets, including 39 per cent relating to services for people with a learning disability. The demographic pressure relating to older people accounts for 42 per cent of total pressure. This might explain why the proportion of directors most worried about the financial pressures relating to services for working age adults has doubled since last year to 32 per cent and compares to only 12 per cent who are most worried about services for older people. The council tax precept is not a sustainable solution. First, it shifts the burden of tackling a clear national crisis on to councils and their residents – and this after years of councils being encouraged to keep council tax as low as possible, or frozen. Second, the value of the precept varies greatly based on the strength of a council’s tax base. Areas facing the greatest demand for services are those that are able to raise the least amount of money through the precept. Already in 2017/18, the adult social care precept was worth 3.8p of every £1 of council tax raised in England. If all councils with social care responsibility used the precept flexibility and the 2.99 per cent core increase in 2018/19 and 2019/20, this would rise to 6.5p of every £1 of council tax. By the same point, councils could be spending as much as 38p of every £1 of council tax on adult social care, up from just over 28p of every pound in 2010/11. Improved Better Care Fund resources are also problematic. As explored further below, this funding has become subject to an increasing and concerning degree of oversight and influence from both government and the NHS nationally. The funding also stops at the end of 2019/20. The consequences of this immediate and medium-term funding gap will likely include a deepening of the consequences seen to date in a range of areas. Quality: Latest information from the Care Quality Commission shows a broadly encouraging picture on quality, with more than four fifths of adult social care services in England rated as ‘good’ (79 per cent) or ‘outstanding’ (2 per cent) following inspection. However, a more worrying trend is emerging amongst services that have been re-inspected. For those services previously rated ‘good’, 76 per cent saw no change to their rating, but 18 per cent dropped to ‘requires improvement’ and 3 per cent dropped to ‘inadequate’. Amongst those services previously rated ‘outstanding’, 64 per cent saw no change to their rating, 19 per cent dropped to ‘good’, 14 per cent dropped to ‘requires improvement’ and 3 per cent dropped to ‘inadequate’. Improving quality is one thing, sustaining it is clearly another and it is becoming harder to achieve. Provider market stability: providers of social care are an absolutely vital part of the social care landscape, delivering practical care services with an essential human touch both to self-funders who pay for their own care and those who are funded by their council. But the provider funding gap outlined above, coupled with new pressures (such as the potential future uncertainty on liabilities for ‘sleep in’ care) is putting providers under impossible pressure. In the last six months, this has resulted in providers ceasing trading across home and residential care in more than 100 council areas, impacting more than 5,300 people. It has also resulted in providers handing back contracts to more than 60 councils, impacting just under 3,000 people. Providers make these decisions reluctantly, especially having worked with local communities and individuals over many years. These are difficult decisions that are made when the full costs of care cannot be covered. Some providers are having to reduce the amount of their capacity used by local authorities because it is not profitable. They may seek to increase their income from self funders or others, such as NHS commissioners. The impact is a loss of capacity for local authorities and a knock on impact on their customers and the NHS. Unmet and under-met need: under the Care Act, councils are required to follow a national minimum threshold for eligibility. This means that there is a single and consistent framework for determining whether a person’s needs are eligible for public support. The level at which this is currently set, combined with the pressures on social care described above, has arguably been partly responsible for an increase in unmet and under-met need. Age UK estimates that there are 1.4 million older people who do not receive the help they need. This includes 164,217 people who need help with three or more essential daily activities (such as washing, dressing and going to the toilet) and who receive no help at all from either paid services or family and friends. As a purely indicative figure, the LGA estimates that if councils were to support this group of 164,217 older people, £2.4 billion additional funding would be needed. Looking to working age adults, and again purely as an indicative figure using estimates based on broad assumptions set out below, the LGA estimates that addressing unmet need amongst the 18-64 population would require an additional £1.2 billion. Unpaid carers also experience unmet need. New research by Carers UK shows that one in seven carers (or those they support) received less care or support in the previous year. Unmet (and under-met) need is bad for people and can lead to the worsening of their conditions, and the costs involved in meeting them. But more broadly, it is bad for our economy and can lead to a huge loss of economic input. As we set out above, supporting people’s wellbeing plays an important role in helping people to be employed, to be active consumers and to be a support for relatives juggling work and family commitments. Carers: our care system could not survive without the invaluable input provided by unpaid family carers. But as pressures mount on social care, carers shoulder an increasing strain and this impacts on their own physical and mental wellbeing. New research by Carers UK shows that 72 per cent of carers in England have suffered mental ill health (such as stress and depression) as a result of caring and 61 per cent had suffered physical ill health. A clear majority of carers believe their mental (57 per cent) and physical (58 per cent) health will get worse in the next two years. When an unpaid caring role breaks down, everyone suffers and costs rise. The research by Carers UK also shows that one fifth of carers had not received a carer’s assessment in the last year. The LGA estimates that it would cost an additional £150 million to provide those assessments. Workforce: like unpaid carers, the social care workforce is at the core of our care and support system. Its scale is significant. But it too is under significant pressure. Skills for Care estimates that the staff turnover rate of directly employed staff working in social care was 27.8 per cent in 2016/17, approximately 350,000 leavers during the year. This compares to average labour turnover across the economy of 15 per cent, and 13.4 per cent across local government direct employment. The National Audit Office has shown that the “growth in the number of jobs has fallen behind growth in demand for care” and that, as we set out above, “The failure of formal care to meet this increased demand may have contributed to the growth in individuals’ care needs not being met”. This trend looks set to continue. Skills for Care forecasts show that if the social care workforce grows proportionally to the increase in the number of older people aged 75 and over, an increase of 44 per cent (700,000 jobs) will be needed. This will be challenging. Directors of adult services believe increasing salaries for care workers is the most important factor in recruitment and retention, which will only increase pressures on budgets. Furthermore, pay rises of 29 per cent over the next three years for the lowest paid NHS staff across England will make the challenge even greater. Directors believe a similar pay rise for social care staff would cost an additional £3 billion a year. But it is not simply a matter of money. As the National Audit Office has pointed out, care work – particularly lower level roles – suffers from negative perceptions and “is viewed by the public as low skilled and offering limited opportunities for career progression”. In terms of the workforce directly employed by councils, social workers and occupational therapists are key regulated social care professionals in local authority social care departments responsible for ensuring the protection of people’s human rights and promoting safety, inclusion and citizenship outcomes. Social work has one of the highest vacancy rates at 10.8 per cent and a staff turnover rate of 15.6 per cent, and only a third of social work graduates enter adult social care. Escalating problems: more generally, the underfunding of social care and support results in people’s wellbeing and outcomes deteriorating as their needs rise and go unmet. This can lead to increased loneliness or the worsening of long-term conditions and results in further demand pressures on the NHS. Social care has already been reformed. Between July 2012 and April 2015, the wider social care sector – people with experience of using services, local government, the NHS, providers, the community, voluntary and social enterprise sector, think tanks, academics and the public – came together with Government to help shape a landmark piece of legislation and prepare for its implementation: the 2014 Care Act. This was a model for how laws should be made; collaboratively, with the voices of those who use services front and centre, and with our national politicians and government in genuine listening mode. It is not perfect, no legislation is. But it is close. It puts people’s wellbeing – broadly defined – at the heart of the Act and stresses the importance of preventing or delaying the development of care needs. It makes a clear link to integration with health in achieving both wellbeing and prevention. It promotes the development of a local provider market offering diverse and quality services for both self-funders and publicly-funded care. It puts unpaid carers on a par with those they care for and embeds person-centred care and personalised approaches to care through the care planning process. It promotes personal budgets and direct payments in order to give people choice and control over their care. However, in spite of a deep commitment to the legislation, councils are increasingly struggling to even meet the ‘letter’ of the law. In a 2018 survey of adult services directors, just 34 per cent stated that they were ‘fully confident’ in meeting all of their statutory duties in 2018/19. The figure dropped to one in ten in 2019/20, with no director ‘fully confident’ of meeting all statutory duties in 2020/21. We can and must do better. Despite widespread support for the legislation, the Care Act has not yet been fully implemented, with the “Part II” reforms to introduce a cap on the amount people might have to pay and an extension to the financial means test limits still waiting to be enacted, partly due to the lack of funding for the system as a whole. The LGA supported the decision to delay the Part II reforms, arguing that the funding earmarked for a cap should be used to support the existing social care system before adding new duties and reforms on top of it. Full implementation of the ‘Dilnot Cap’ as set out in the Care Act is one of the reform options considered in the next section. Our estimate of the cost uses Age UK figures as a starting point. We take their figure of 164,217 – the number of older people who receive no support with three or more essential daily activities – and assume support for those people based on the profile of existing support for older people in terms of home care and residential care. We then apply unit costs: for home care we cost 1 hour per day; for residential we cost a year of residential care. We apply the same method used for estimating the cost of meeting unmet need amongst older people. However, as we do not have a starting number (equivalent to the Age UK figure of 164,217) we link to the number of working age adults currently receiving services. The number of working age adults supported is roughly 40 per cent of the number of older people supported so we apply that percentage to the Age UK figure and apply working age adult unit costs for home and residential care.